Here is a great video on an augmented reality application that could become quite powerful in the classroom. It is called Argon and it is an open-source augmented reality browser that will be coming to a phone near you very soon. This browser will allow people to view the real world with their phone cameras and see added content, links, applications and various other information. All of this information can then be accessed and viewed on their mobile device. This is a great idea by the people at Georgia Tech. In a quest to look for ways to get my students outside active and learning in the real world. I have begun messing around with different Augmented Reality Applications. I have made a couple of games using different programs, as regular readers of my blog know. If you are a new reader and are interested in these past blogs click here for a list of past blogs on this topic, or click on the Augmented Reality in Schools link on the left side of this blog. I have had phenomenal success with this type of application in the classroom from the few games that I have created, so I have begun to look for more programs to create these types of applications. The following is a list of 7 programs that I believe could be excellent for creating location based educational games. Note: All of these programs require the use of a GPS enabled device to play like a cell phone, or Garmin GPS device etc. FourSquare : This application can be used on almost all hand-held devices from the iPhone to Android. It is very universal and is great for scavenger hunts. Has a large support community and is well maintained. You can download the app from the Android App store. SCVNGR : The idea behind this site is to complete challenges at specific locations. This application is also for the iPhone and Android devices and is well developed. This application allows users to collect points and easily share information and locations like FourSquare above. You can download the app from the Android App store. Joyity : Like other location based games this turns your environment into a game space. At different locations you must complete certain tasks to earn point and accomplish missions. “JOYity is for use on both Android smartphones and Java (J2ME) phones.” You can download the app from the Android App store. 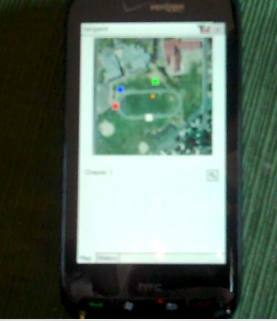 GPS Mision : This is a webbased game creator for Windows Mobile phones, Nokia and the iPhones. This application allows you to create location based games. You can also download and play games as well. WhereIGo : Originally designed for Geocaching, this application can be easily converted into location based games. This application is limited to Windows Mobile devices and Garmin GPS devices. Game creator can only be used on specific Windows machines. You can download the app from the Android App store. Tourality : This location based game like the others can be played on Andriod, Nokia and Blackberry devices. You can download the app from the Android App store. Another great application for multiplayer games. Layar : This application can be download on most devices. This application is great for overlaying material over the real world using the camera on the device. Great for showing what something looked like in the past or may look like in the future. You can also overlay game characters to instruct or provide information for the game. Here is a great video that shows the type of things that this type application can deliver to students to engage them. 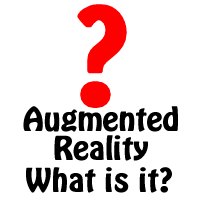 As many of you know I have discussed “Augmented Reality” many times in this blog. To see these posts check out the “Augmented Reality in Schools” under my blog topics. Lately I have received many comments and emails from my readers asking me to explain this concept a bit more for them. So as I sat down to compose a response I came across a great video on the topic by the Common Craft Show. They state that this video is, “An introduction to a new technology that adds a layer of useful information to the “reality” we see on screens of mobile phone and computers.” So here is a great starting point that might help some of you who are visual learners like me. What is Augmented Reality? REALLY! Over the past year I have begun working on creating alternative learning environments in a real world setting. In my quest to create these so called augmented reality environments I have begun to wonder if the term “augmented reality” is appropriate. It seems as read other blogs and look at new apps for phones, that every time I turn around there is a new augmented reality application. So my question is should we look at redefining what is augmented reality and maybe create different types or classifications? What do you think? Yesterday, I finally got to try out my Augmented Reality game, “Manifest Destiny“. I was excited to give this a try and see how this new type of learning environment might work with my students. In the past I have run some short trial games to see how the software worked and all of the those tests the students seemed to really enjoy. This was the first complete game with a specific learning target in mind that students had to completely discover on their own. Students had no prior knowledge of the topic of “Manifest Destiny”. The learning target for this game was: Students will be able to describe and define Manifest Destiny? Students were given four questions to answer as they progressed through the game. What are the three political factors influence the development of Manifest Destiny? What are the three social factors influence the development of Manifest Destiny? What are the three economic factors influence the development of Manifest Destiny? Students were placed into groups of three and each student was a different character in the game. At each location each member of the team met a different historical figure. The historical figure presented each student with some information. After the students listened to their historical character the students must then discuss what they have heard in their groups to get a complete answer. Each member of the group received vital information that must be incorporated into the answer to each question. Once they have answered their question the group then moves on to the next location. Students seemed to be very engaged in this type of learning environment. They quickly learned how to use the device and how to use the interface of the program. Both of these were concerns for me at the beginning of this exercise. Students really seemed to be enjoying themselves and all said that they would like to do this type of thing again. Some of the complaints were that the questions were to hard. They stated that they would like to just receive the answer and not have to try to figure it out at each location. Some said that they would like more interaction at each location. they did not just want to be presented information at each place but rather interact with the device. In grading the assignment that went along with this activity all groups received a 70% or higher on the questions. I felt as though the main learning target had been met by a majority of the class. Something that might have worked out better was to not have the questions on the device but on a separate sheet of paper. I did find that student engagement and motivation was very high for this activity. However, the fact that this was a new activity with new technology might have a big part in the motivation. All in all I thought that this type of learning environment showed a lot of promise. I will be looking at doing another game shortly based off of what I learned from this game. Well, I have been off of the grid lately, working on a new augmented reality game for my students. This game is designed to introduce them to Manifest Destiny. ﻿ ﻿There were two things that I was hoping to accomplish with this game. First, to introduce them to Manifest Destiny, and second to get them working together. This game is set up so each student in the group interviews a different character. Each person in the group receives only a portion of the answer in their interview, making it necessary for the students to work together to get the correct answer. Each stop has a question that is presented to them at the beginning of the game that will be answered a long the way. 1. What is Manifest Destiny? 2. What are the three political reasons that influenced the development of Manifest Destiny? 3. What are the three economical reasons that influenced the development of Manifest Destiny? 4. What are the three social reasons that influenced the development of Manifest Destiny? 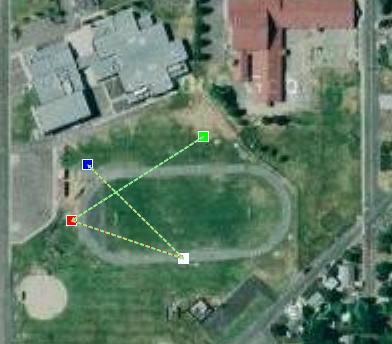 The entire game takes place on the back field of our school with a total of four stops in the game. I am very excited to try this game out on Monday. Wish me luck!